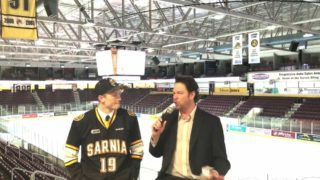 For the third straight week, the Sarnia Sting were ranked as the number one team in the Canadian Hockey League. After splitting a pair of games this weekend, the Sting have once again shown that their offensive firepower is some of the best in the country. 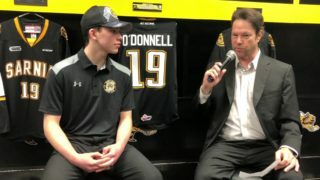 On Friday night, the Sting hosted the OHL’s number two ranked team, the Sault Ste. Marie Greyhounds. After sparring against the Greyhounds just two weeks prior, it was another intense game at Progressive Auto Sales Arena. This time around, the Hounds took the win in round two. But, the game was an absolute battle. Though Sarnia had fought back to tie the game with just minutes remaining, the Soo took a 4-3 victory in overtime. However, lessons were learned and the Sting were hungry for more in their next game. On Sunday, the Owen Sound Attack were savaged by a Sting offense out to prove their strength. Jordan Kyrou lead the way with two goals, Hugo Leufvenius had three assists, and Justin Fazio recorded the shutout in a 7-0 win. One of the highlights of the weekend was definitely Curtis Egert’s first career OHL goal on Sunday. Egert gathered the puck into a two-on-one rush and went top shelf on the Attack netminder. Derian Hatcher spoke following the Sting’s 7-0 victory over the Owen Sound Attack on Sunday. The Sting have somewhat of an irregular schedule this week. On Wednesday, Sarnia visits the Flint Firebirds for an 11:00 AM school-day game. The Firebirds are led in points by Maurizio Colella and Ryan Moore, who each have 18 points on the year. 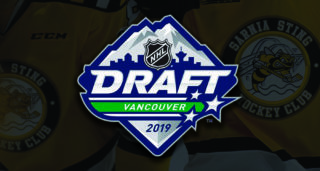 Dallas Stars prospect Nicholas Caamano has 17. On Friday, the Sting return to home ice with a huge game against the Windsor Spitfires. Aaron Luchuk has been a force as the Spits’ new captain this season with 20 goals in 20 games, tops in the OHL. To round out the week, Sarnia visits Guelph for a Sunday evening matchup with the Storm. Game time is 6:00 PM at the Sleeman Centre.